An official in Sparta and in other parts of Greece. Officials called "ephori" were employed among the Jews: (1) in the service of the Temple at Jerusalem (Yoma 9a); (2) at Babylon (Yeb. 45b); (3) in the Byzantine empire, where an ephoros who supervised prices, weights, and measures ("Basilica," i. 42) was included in the organization of the Jewish community. 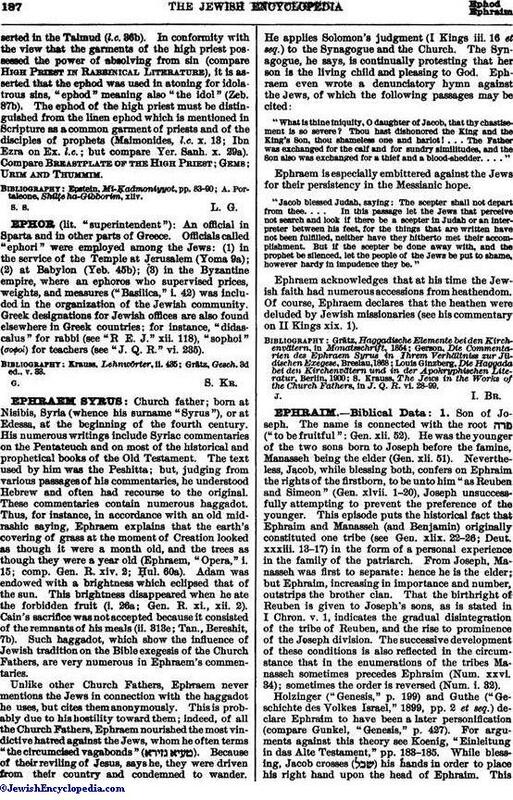 Greek designations for Jewish offices are also found elsewhere in Greek countries; for instance, "didascalus" for rabbi (see "R E. J." xii. 118), "sophoi" (σοφοί) for teachers (see "J. Q. R." vi. 235). Grätz, Gesch. 3d ed., v. 33.